FlexeraSoftware’, née Acresso’s, née Macrovision’s, née ZeroG’s program that lets you produce executables for installing Java apps for a variety of platforms. The IDE (Integrated Development Environment) itself runs on W2K, XP, W2003, Vista, W2008, W7-32, W7-64, W8-32, W8-64, W2012, W10-32, W10-64, Linux, LinuxARM, LinuxX86, LinuxX64, Ubuntu, Solaris, SolarisSPARC, SolarisSPARC64, SolarisX86, SolarisX64 and OSX It also produces distributable executable installers for those platforms. It claims to produce much smaller distributables that install faster than the Install Shield competition. Further, it will also handle installing a suitable Java VM. The following information comes from my experience with the product since 2001. Some of what I say will be be dated. If you ask it to install the JVM (Java Virtual Machine), it makes a private copy. Every app gets its own copy of the JVM. You soon fill up your client’s disks with duplicate copies of the JVM. If the end user has several JVMs (Java Virtual Machines) installed it asks the user which to use. Most end users have no clue what to answer. You can’t configure the JVM required at build time. You or the user cannot independently control whether an icon appears on the desktop, task bar, or start menu. If you include an entire directory in the distribution, then add yet another jar to that directory, it will not be included. You must delete the directory and re-add it. for doing them a favour of reporting the bug. You can’t specify whether included data files should override the user’s existing files or not. They always replace. The version 3.5 has more customisation powers, but it is flaky. It did many strange things and then gradually stopped doing them, without rhyme nor reason. Even without JVM you add about 1 MB to your executable download size and roughly the same amount to the installed executable. Ideally this overhead should be downloaded once, not once per app. I have exchanged many emails and phone calls with the InstallAnywhere people. I hope they follow my advice and make the free InstallAnywhereNow more foolproof for the end user, but limit it to tiny apps. Instead they dropped the product. Unfortunately version 4 still gaves you no way to control which VM your app gets connected to. Its downloads are about 200K bigger than version 3.5, a little over a megabyte of overhead on each download, exclusive of the VM. The main new feature of version 4 is the ability to include a jar file that is automatically expanded as part of the install. InstallAnywhereNow does not have a way of pre-installing the generic installer once, the way you can with Web Start which would remove that overhead. The advantage is the downloads are totally self-contained. version 5 has the power update feature similar to JNLP (Java Network Launching Protocol) for automatically installing upgrades to your customers. The major enhancement in the use of XML (extensible Markup Language) files to control the installer. This product is now defunct. I tested version 6.1. It is in some ways even worse than earlier versions. To include other than the Macrovision default JVM, you must download VMPACKS from Macrovsion before you do your builds and put them in your F:\Program Files\InstallAnywhere 6 Standard\resource\installer_vms directory. The Applet style install aborted three times without error message when I tried the download of InstallAnywhere itself. The download was only partly complete. The style where you select the platform yourself behaved normally. 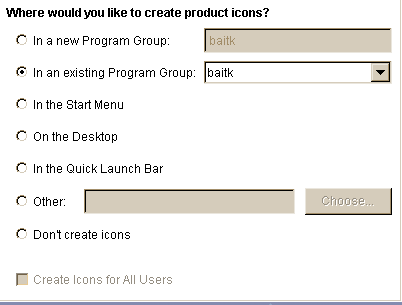 When the user installs your app in Windows, he is given a multiple choice radio button question "where would you like to create the product icons?" Usually he wants them all, not just one. These should be checkboxes, not radio buttons. ZeroG has acknowledged the problem and has logged a fix as a feature request. Its launcher is a small C program called main.exe that looks for a text file called main.lax which tells it where to find the JRE (Java Runtime Environment), the name of the main class to launch and the classpath. It is actually having trouble finding com.zerog.ia.integration.ant.InstallAnywhereAntTask not org.apache.tools.ant.taskdefs.ExecTask. Don’t try putting jars in the jdk1.8.0_131/jre/lib/ext directory. For some reason this confounds ant so that it can no longer find the sun.tools.javac.Main class located in jdk1.8.0_131/lib/tools.jar.